It’s only a matter of time before electric refuse trucks become more mainstream. significant federal and state stimulus for electric vehicles. Pending state legislation, the California Electric Vehicle Initiative (AB1184), would greatly increase funding for electric vehicles. Electric car sales in the U.S. have seen more than 70 percent growth in the past year. Since they are only approximately 1 percent of all U.S. car sales, continued growth opportunities are significant. Electric trucks also are on the horizon, and some are already here. In April, Elon Musk unveiled plans to build two electric trucks, including a semitruck and pickup truck. Earlier in the year, Daimler, Stuttgart, Germany, released a test version of its electric semitruck. Smaller brands, such as VIA Motors, Orem, Utah, already are selling all electric pickup trucks. Here in SoCal, an electric refuse collection truck (developed by BYD, Shenzhen, China, and Wayne Engineering, Cedar Falls, Iowa) was tested in early 2017 in Los Angeles. The city’s sanitation department tested the electric truck on the same routes as its other trucks. The electric truck averaged 4 tons per day of refuse collected and had range of approximately 100 miles per day. Last month, Sacramento, California, added an all-electric refuse collection truck to its fleet, a first in California. The truck was built by Motiv, Foster City, California. Chicago also has contracted with Motiv to build up to 20 electric trucks. The city required that the electric trucks meet the demands of its current refuse collection fleet, including a 60-mile range and a payload of 9 tons. Electric collection trucks will provide cleaner and healthier air in the cities where they operate. They will not create emissions, which will improve local air quality, and the electricity used to recharge batteries will come from a power generator with an individual emission point and pollution control equipment. Increasingly, our utility electricity supply comes from renewable sources. Currently, the U.S. gets about 10 percent of its electricity from renewable sources, and this is on an upward trajectory. This renewable energy can come from solid waste. Solid waste complexes can be developed that not only handle refuse but that also produce electricity. In addition to cleaner air and opportunities for renewable energy generation, electric trucks are quieter, which reduces noise pollution. Time will tell if electric collection vehicles will become a significant component of solid waste collection systems, but a few things are clear. Electric trucks will make the most sense in densely populated areas, where collection is most efficient. It also is in these densely populated areas that electric trucks will have the biggest impact on the local air quality and on human health. Neighborhoods also will be quieter. Electric trucks may create opportunities such as new renewable energy from waste generation. Over the next few years, data will be collected on the performance of electric trucks and used to improve performance. If you ask me, the future of collection trucks is electric! John G. Carlton, P.E., BCEE, is senior vice president of GBB and can be reached at jcarlton@gbbinc.com. He thanks Ann Marie Carlton, Ph.D., P.E., for her contributions to the column. People should think twice before breaking waste disposal rules. “Rules are made to be broken” is an old adage that often follows a poor decision. It might be a fun thing to say before taking a risk of some sort. But in the case of waste, rules are definitely in place for a reason. If a municipality requires disposal of hazardous waste separately from the trash, that rule was implemented for a reason. If a recycling provider bans needles and batteries in its recycling program, it is warranted. Not following the rules for disposing of materials can have harmful consequences. In recent months, several incidents where materials weren’t disposed of properly caused a lot of commotion and put waste and recycling workers and their customers at risk. The first occurred at the Metro South Transfer Station in Oregon City, Oregon, when a container of muriatic acid, also known as hydrochloric acid, tipped over, causing a chemical reaction. The chemical should not have been disposed of in the trash. Another incident occurred inside a baler at the Kent County Recycling & Education Center, Grand Rapids, Michigan. Three small camping-style propane cylinders, which are not recyclable, wound up in the baler and caused an explosion. In yet another incident, the discovery of picric acid in a customer’s car at the La Crosse County, Wisconsin, landfill, required the evacuation of the facility while hazmat teams detonated the substance. Facilities aren’t the only segment of the waste industry at risk from improper disposal. Collection trucks also can catch fire if substances in trash or recyclables are flammable or combustible. In the majority of these cases, proper disposal of hazardous materials could have avoided the incidents. Luckily, no one was seriously injured in any of the aforementioned events. But these incidents should serve as lessons. Hearing about the consequences of careless people’s actions hopefully will cause people to stop throwing items in the trash or recycling bin that don’t belong there just because it is easier than dropping them off at a proper disposal site. Just as most people don’t want to be that person who throws a cigarette out of the car window and sparks a forest fire, they don’t want to be the one who threw out a hazardous chemical in the trash and caused an injury to someone. If people choose to take a risk or break a rule from time to time, who am I to stop them from making that choice? If, however, one of the rules they are considering breaking has to do with their trash or recyclables, I hope they will think twice before proceeding. Someone’s life may depend on it. WasteExpo 2017, May 8 to 11 in New Orleans, showed the industry’s increased interest in diversion and data usage. The future of the waste industry is moving toward computerization and data mining. Many speakers during WasteExpo 2017 discussed how big data, telematics and other technologies are allowing smarter operation in the industry. They also discussed increased interest in organics diversion and creating renewable energy from waste. More than 12,000 waste industry professionals roamed the halls of the Ernest N. Morial Convention Center in New Orleans during WasteExpo 2017. The event, May 8 to 11, allowed attendees to see new products and technologies on display from more than 620 exhibitors and to attend more than 100 educational sessions on a wide range of topics, including recycling, technology, food waste and renewable energy. Recording data is one thing, but deriving meaningful conclusions from them to provide direction is quite another. During a session titled Smart Cities with a Solid (Waste) Plan, speakers shared how their communities are doing just that. Susan Fife-Ferris, director of solid waste planning and program management at Seattle Public Utilities, shared what the city of 700,000 people is doing with its data. She said data doesn’t just come from one source; it is collected by contractors, haulers, processors and an assortment of other entities. The city conducts research and studies and uses focus groups and stakeholders in its data gathering. Within Seattle, private recyclers, composters and transfer stations operate. The city has two transfer stations operated by Seattle Public Utilities, including a new one. One of the struggles Fife-Ferris said Seattle faces is that many people live in the suburbs and come into Seattle for work and vice versa. This creates difficulty in terms of consistency in recycling across the region, she said. The city has 155,000 residential carts, 4,000 residential dumpsters and 6,000 commercial dumpsters. Recyclables and organics are banned from the dumpsters. Garbage collected from the city is long hauled by rail to Arlington, Oregon, about 320 miles away. This rationalization seems to work on residents; only 2 percent have a 96-gallon container for their trash. Most have smaller containers. Enforcement of correct recycling is another component of the program. Residents who don’t recycle correctly are given an “Oops!” tag on their bins to help correct their behavior. “Education and outreach are of huge importance,” Fife- Ferris emphasized. She added that disposal bans also help to drive recycling programs. Jim McKay, general manager, solid waste management services, city of Toronto, said Toronto has similar challenges. The city has a population of 3 million that is split roughly evenly between multi- and single-family homes. Commercial and industrial recycling are managed through the private sector. Toronto has a three-cart program with 1.3 million carts in use. It has transfer stations and drop-off locations, which McKay said don’t make sense anymore because fewer people are driving and more are relying on public transportation. Toronto is paying to landfill materials so it wants to put as little in the landfill as possible. It is also managing and monitoring about 160 closed landfills. “We are paying $12 million a year just to maintain those sites,” said McKay. Canada operates a little bit differently than the U.S. because it has extended producer responsibility (EPR), where manufacturers and distributors are responsible for funding a portion of recycling costs for the Blue Box program for packaging. It provides an extra revenue stream to the city. Toronto also has curbside green bin and biweekly garbage collection. “When you switch to biweekly pickups, it is that much more incentive to divert more material,” he said. The list of organics the city accepts is extensive because of the flexibility its two anaerobic digestion systems offer. The biggest change coming down the pike for Canada is in EPR policy. Over the next several years, companies will go from paying 50 percent of the cost of the Blue Box program to paying 100 percent of the cost. Consumer goods companies have agreed to this plan as long as they can take control of the recycling system. It will be run by an organization made up of companies like Proctor & Gamble and Coca-Cola. McKay said Toronto has an aspirational goal of zero waste. “We are trying to shift away from zero-waste and more toward a circular economy concept,” he said. The city also is moving to mobile depots for recycling, bringing services to high-rise complexes, for example. Textile recycling is another area the city is looking at as textiles are a large part of the waste stream. One of the challenges for Toronto is its urban density. It is looking at a “more condensed solution than all these bins,” said McKay. When it comes to recycling right and efficiently and to increasing diversion, many boxes must be checked off to ensure a smooth process overall. In terms of increasing residential curbside recycling, the most cost-efficient and effective program has proven to be pay as you throw (PAYT), said Lisa Skumatz, an economist at Skumatz Economic Research Associates Inc. (SERA), Superior, Colorado. In the session Residential Collection Best Practices, Skumatz said it is “incumbent on us to spend money wisely.” Therefore, she concluded through extensive research that the most valuable program to implement is PAYT for garbage. Factors such as curbside cart size and frequency of collection also play roles in recycling rates. Skumatz said recyclers should consider every-other-week collection. Integrated collection—where the same hauler collects trash and recycling loads—also saves money, she said. Beyond switching the frequency of collection, education and awareness are crucial to getting people to recycle correctly. While education and outreach efforts are “not cheap,” Skumatz recognized, they are worth it. However, modern efforts are not as effective as they could be. “There are ways to make the education you offer more effective,” Skumatz said. More coverage from WasteExpo 2017, including daily video coverage, video interviews and session reports, is available at www.WasteTodayMagazine.com. She pointed to the feeling of empowerment and the need people have for self-efficacy. People like to feel as if what they are doing makes a difference, and reminding them of the benefits of recycling could help to drive that message home. Door-to-door marketing, rather than social media marketing, is more convincing, she said. It also is important to consider incentives and bans, Skumatz said. She suggested creating different tip fees based on varying material streams. Michael Casella, division manager at Rutland, Vermont-based Casella Waste Systems Inc., said companies should also focus on fleet costs rather than just on disposal costs. “People focus just on disposal costs, but really they need to focus on truck costs,” Casella said. He also spoke to attendees of the Residential Collection Best Practices session. Along with costs associated with collection trucks, Casella said contract length dictates economics. Properly managing the length of contracts helps to ensure new trucks are covered as well as any changes to services, such as the addition of organics collection. Casella suggested bundling residential organics collection into the municipal contract. Casella Waste Systems recovered 1.2 million tons of waste in 2016, recycling 800,000 tons. The company, an integrated solid waste services firm, serves Massachusetts, Maine, New Hampshire, New York, Pennsylvania and Vermont. Big data, according to several speakers throughout the conference, can be used to increase efficiencies in different industry sectors. In the session Big Data & Smart Waste, speakers discussed how data collection is affecting customer service and outreach as well as route optimization. They also detailed how to pin down the most relevant data sets. According to Don Ross, director of operations at Kessler Consulting Inc., Tampa, Florida, big data often can range from a terabyte to many petabytes in size, which may be more than the waste industry needs or even can handle. Data can be used in a variety of ways and are captured by different technologies, such as cameras, radio frequency identification tools (RFID) and in-cab devices, made for different purposes. Scott Lukach, vice president of environmental services at Rehrig Pacific Co., Los Angeles, said gathering data and using the information in certain applications, such as those mentioned previously, is only the beginning for the waste industry. In general, data are changing the way the world lives—from how objects are purchased to how people communicate, he said. Cloud computing is pushing the “clunky” technology of old off to the wayside. It is capable to holding more information while taking up less room. Older technology, such as scanners, didn’t communicate well with other devices and were unreliable. Now, with RFID tagging on containers, machine-to-machine communication allows for a more reliable set of data, he said. This, Lukach said, allows waste companies to create marketing campaigns with more focus and to develop closer relationships with their customers through mobile apps. The authors are editors for the Recycling Today Media Group and can be reached at hcrisan@gie.net, ksmith@gie.net and mworkman@gie.net. The ongoing leachate problem at the regional landfill in Suffolk, Virginia, is estimated to cost $1.9 million to fix. The Southeastern Public Service Authority (SPSA), Chesapeake, Virginia, authorized the contracts during a special meeting April 12. The contracts include $138,000 to Conley Environmental of Chesapeake to improve more than a mile of roadway inside the landfill to accommodate tanker trucks and up to $1.8 million to Atlantic Heating & Cooling of Virginia Beach to haul 200,000 gallons of leachate per day over a five-month period that began May 1. The leachate will be brought to four Hampton Roads Sanitation District treatment plants at a 6-cent-per-gallon rate. The contracts allow the first phase of the cleanup process, which is estimated to take about five months, to begin. More than 30 million gallons of leachate were found accumulated in two active cells of the landfill in late January, with 60,000 to 70,000 gallons more being generated each day. As much as 80 million gallons of leachate may be removed and the SPSA eventually may have to build its own treatment facility, according to reports. The SPSA is currently pumping 50,000 gallons of the liquid per day through a sewer line to the sanitation district’s Nansemond plant in northern Suffolk, but it decided to bump up the removal rate to 250,000 gallons per day by adding truck hauling to the process. The Virginia Department of Environmental Quality allows no more than 1 foot of leachate build up. The landfill housed about 30 feet of liquid. It could take a year before leachate is at that level. The Army Corps of Engineers says in its March newsletter that it plans to dispose of contaminated material removed from the former Brush Beryllium site near Luckey, Ohio, at the Waste Management Evergreen Landfill in Northwood, Ohio, and the U.S. Ecology Landfill in Wayne, Michigan. According to a report in The Press, the Corps has identified soils contaminated with six substances, beryllium, lead, radium-226, thorium-230, uranium-234 and uranium-238, as needing to be excavated and disposed off-site. The article also states the Corps is estimating the cost will be closer to $244 million, much higher than its initial estimate of $59.4 million. The higher cost, the report states, is because of an increase in the estimated amount of contaminated soil. Two buildings at the site will reportedly have to be removed to fully address the contamination. The Corps estimates 137,467 cubic yards of soil need to be excavated, including about 7,600 cubic yards of adjacent clean soil. Another 47,858 cubic yards of contaminated building debris may also be removed, the report says. The Corps held a meeting March 28 for residents in the Luckey area to view plans for cleaning up the plant. The Press says the site was used to process beryllium in the early 1950s, and the U.S. Atomic Energy Commission (AEC) sent about 1,000 tons of radioactive scrap metal there for processing magnesium. Beryllium scrap containing some radioactive materials from other AEC operations also reportedly was sent to Luckey for reprocessing. The current property owner, Industrial Properties Recovery LLC (IPR), an industrial scrapping business, purchased the property in 2006 and began demolishing several buildings. According to the report, the Ohio Department of Health ordered IPR to cease the demolition of buildings and handling of any radioactive material in December 2006. The site also was deemed a public health and safety concern by The Wood County Health District. The Wood County Common Pleas Court issued an injunction against IPR in June 2009, which required the company to either demolish or make necessary repairs to site structures and salvage or properly dispose of all debris, The Press article states. The company reportedly resumed demolition and salvage activities in late 2013. Later that year, the health department issued another order for the company to cease the removal of material from the site unless it has been confirmed as not having radioactive contamination. The Ohio Environmental Protection Agency issued an order to halt demolition of site buildings in January 2014 until the company complied with state asbestos and air quality regulations. The Solid Waste Association of North America (SWANA), Silver Spring, Maryland, and the Environmental Research and Education Foundation (EREF), Raleigh, North Carolina, are conducting a joint research project to quantify and address the issue of needlestick injuries at material recovery facilities (MRFs) in the U.S. and Canada. Needlestick injuries are a serious risk to waste industry workers, especially in MRFs where sorting recyclables on picking lines and similar activities can put employees in contact with sharps and, as a result, bloodborne pathogens. The objectives of the survey are to inventory observances of needles and syringes in MRF material streams in the U.S. and Canada and document the extent of needle-related incidences, both those that resulted in no injuries and those that did. 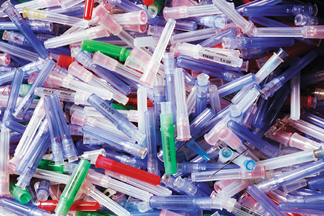 Historically, the frequency of needles and syringes in the recycling stream and the incidence rate of associated injuries in MRFs have not been well-documented, though it has been suggested anecdotally that these rates have increased in recent years. This suggestion is consistent with the increased disposal of needles and syringes generated by older Americans in their homes. “If successful, SWANA and EREF may survey companies and sanitation departments to assess needlestick issues in the collection side of the industry as well,” adds Biderman. This project is one of the first to be conducted under the terms of a memorandum of understanding that was executed by the two organizations in late 2016. Results will be aggregated in a form that keeps the identity of individual facilities private. The survey is available at https://erefdn.org/needlestick-incidences-material-recovery-facilities-mrfs.